Quesadilla is a Mexican dish, now popular around the world. Typically, flour tortillas are filled with an assortment of veggies, and cheese and is then cooked in a pan or a grill. The recipe for the quesadilla I am sharing today comes with the goodness of mix vegetables and protein-rich cheese. Long back I had a similar quesadilla at a local Mexican eatery - Picantos in Pune and since then I make my own version of it at home. Tortilla wraps are not easily available in India but that is not a cause for concern as home-made whole-wheat chapatis can easily replace them in this recipe. This is a great dish for kids who are bored of eating the regular chapati and sabji combo. You can get as inventive as you like when it comes to the filling - try only corn and capsicum filling, zucchini and mushroom or a mixed veg filling like mine. 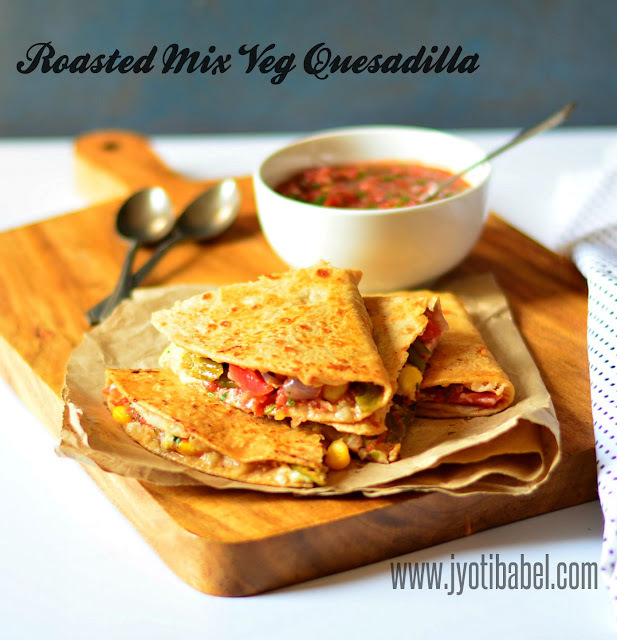 Let's check the recipe for roasted mix veg quesadilla recipe now. 1. In a bowl, mix veggies, oil, salt and pepper. Toss around well. 2. Line a baking tray with parchment paper, add the veggies and grill it in an oven at 200 C for 8-10 minutes, till the veggies are slightly cooked charred. Alternately, you can also pan roast the veggies on the stove top. 3. Take a tortilla wrap or homemade chapatti and arrange the roasted veggies in one half and place a layer of grated cheese over it. Fold it to form a semi-circle. 4. Apply some butter on each side and cook on a pan till both side are slightly golden in colour and the cheese has melted. Repeat the same with rest of the tortilla wraps. 6. Serve these hot with hot spicy tomato salsa. Kids can enjoy it with ketchup as well. The filling can be easily customised as per one's taste or on the availability of veggies. Mushrooms, zucchini can also be used if you like them. Quesadilla looks so yummy.. Didn't know we could make it with chapati!! Mixed veg quesadilla are so popular in my house too. The best part is you can throw in any vegetable and with cheese kids don't mind eating. Lovely recipe. The mix veg filling sounds interesting. We so love these quesadillas. I also make them at home. Quesadillas is a kids' favorite for sure with all the cheese and goodness that goes in... the pictures are lovely! Your version of quesadilla is healthy and rich in veggies , awesome to feed the fussy kids as cheese makes it up . I haven’t made these in a long time , thanks for reminding ! 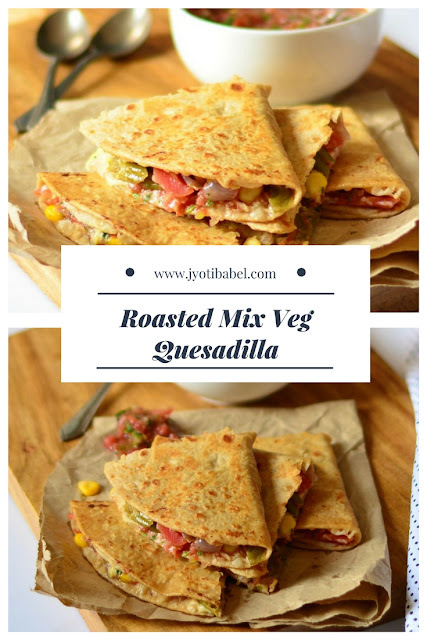 Quesadillas are my favorite and this version sounds superb!..very lovely clicks as well..
Never get bored of quesadillas and those roasted vegetables makes those vegetables more healthy and tempting. Am a big time fan of quesadillas :) these looks so delicious, am unable to resist myself. I know even a fussy eater would love to indulge .. An very yummy use of veggies. mix veg quesadilla looks so mouthwatering. I love it a lot and find it easy to feed so many veggies to kids. Lovely clicks. 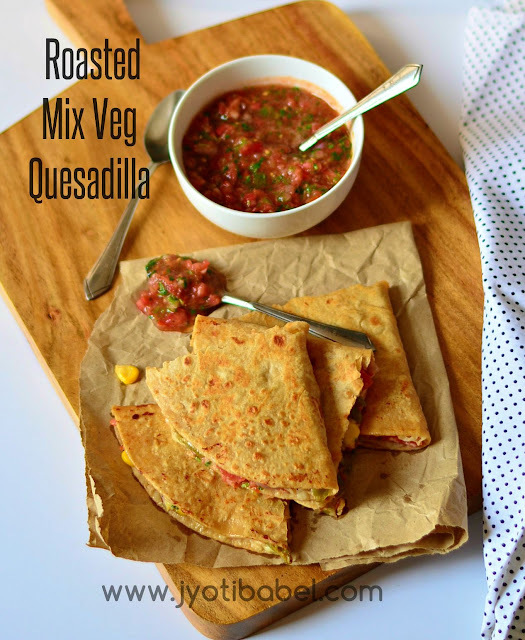 Love your mixed veggie filling in these quesadillas Jyoti. They look so colorful, cheesy and absolutely delicious. i'm sure they will run for it.